Yes, vast numbers of cartoonists have taken up the subject, from many angles, some more than once. Here are two slashing images of POTUS and his response(s) to the event: Jon Berkeley’s cover for the August 19th issue of the Economist, and Peter Kuper’s New Yorker daily cartoon on the 15th. Jon Berkeley. POTUS and his KKK-aphone are treated in the cover story in the Economist, “After Charlottesville: [REDACTED] has no grasp of what it means to be president: U-turns, self-regard and equivocation are not what it takes” And in an accompanying story, “After Charlottesville: [REDACTED]’s failure of character emboldens America’s far right: The only principle guiding the president seems to be to support those who support him”. 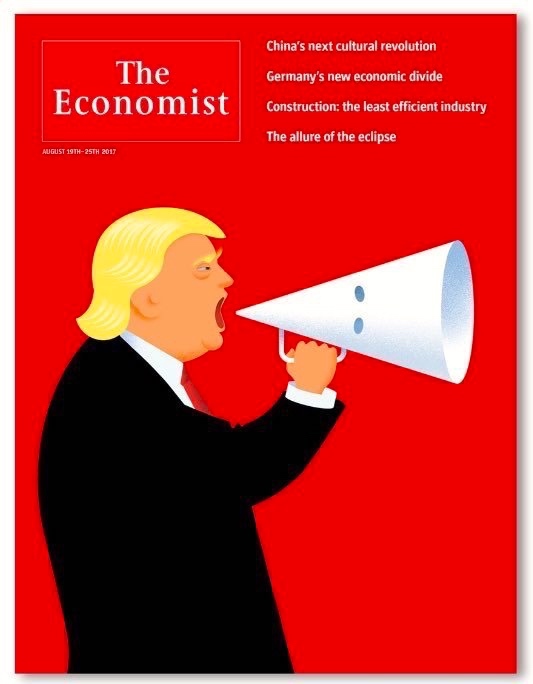 Courtesy of Irish illustrator Jon Berkeley, the stark cartoon shows [REDACTED] bellowing through a megaphone drawn to double as a Ku Klux Klan hood. Appearing days after a violent white supremacist rally led to the death of three people, the image is a blatant nod to [REDACTED]’s much-criticized comments this week blaming protesters “on both sides” of the conflict in Charlottesville, Virginia. “You had a group on one side who was bad, and you had a group on the other side that was also very violent, and nobody wants to say that, but I’ll say it right now,” [REDACTED] said, referring to white supremacists, anti-fascists known as “antifa” and counterprotesters. “What about the alt-left that came charging at the, as you say, ‘alt-right’?” he added. In an interview with HuffPost, Berkeley explained that the cover was commissioned on Wednesday, a last-minute decision on the part of the Economist following [REDACTED]’s press conference on Tuesday. A few concept sketches later and his powerful presidential portrait was born. [KB] How did you settle on the image of [REDACTED] holding a megaphone that appears to double as a KKK hood? [JB] I always think with a pencil, so I did a few quick sketches to start the process. The KKK hood is a gift in graphic terms. It’s simple, and its menace is instantly recognizable. It’s been used to great visual effect by many illustrators and cartoonists, so when I linked it to the shape of a simple megaphone, the first thing I did was search online to see if it had been done before. When I found nothing similar I sent the sketch ― along with a few other concepts ― to the Economist. [KB] What were your initial reactions to [REDACTED]’s remarks this week ― particularly his use of the phrase “both sides”? [JB] It seemed an obvious reluctance to criticize the far right. Personally, I’m not sure that [REDACTED] has the intellectual capacity to understand the full context of his remarks. Even if this is the case, it doesn’t say much for his choice of advisers, does it? [KB] The Economist has a reputation for being a moderate publication, respected by liberals and conservatives. (In 2013, the Economist itself claimed to be a part of the “radical centre.”) In light of this, what message do you think a cover like yours sends to readers? [JB] We seem to be in uncharted territory in terms of eroded trust in the media. I’ve had a quick trawl through some of the comments the cover has attracted on the Economist’s Facebook page, and they seem as polarized as ever. Right-wing commentators are calling it liberal bias. Others are applauding it. 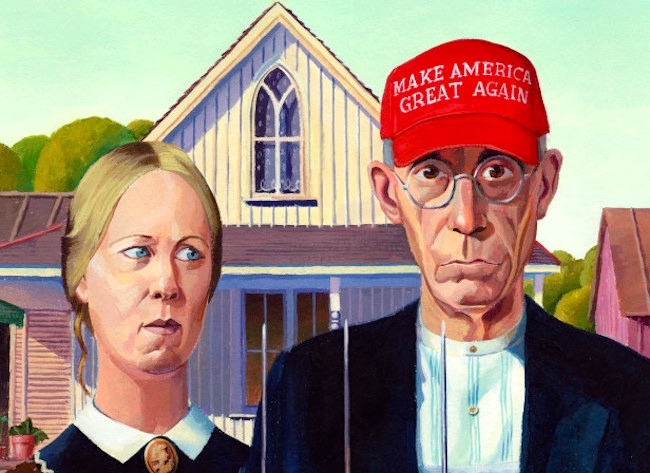 [KB] As a longtime illustrator who’s been creating political cartoon–like images for publications like the Economist, how has your job changed ― if at all ― in the last year since [REDACTED]’s candidacy? For example, do you feel a greater responsibility to confront politics in your work today? [JB] We live in interesting times. I’ve always had an interest in politics, and political cartooning. The supply of weapons-grade lunacy in every corner of the globe seems to have ramped up considerably in the past year, which just gives more to push against. I’ve been posting editorial cartoons on my Facebook page recently, just to get things off my chest, which is something I only did occasionally in the past. To be frank, it’s one part responsibility to three parts fun. Jon Berkeley (born 1962) is a Dublin-born illustrator and children’s author. [His] work typically features a strong central concept with a twist. 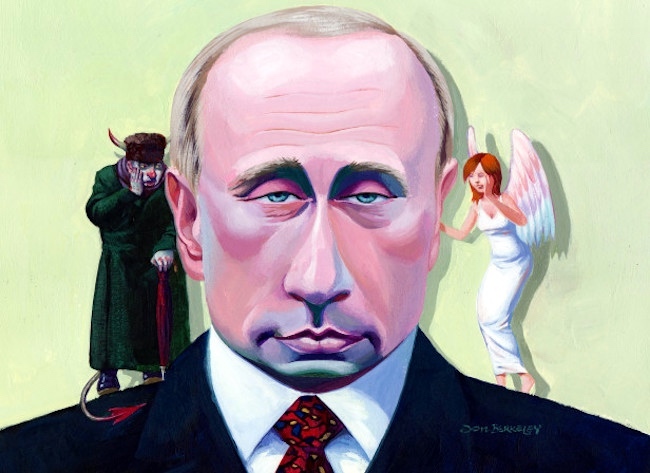 He is also known for his sharp and colourful caricatures which have appeared in The Sunday Times UK, Hot Press and The LA Times among others. 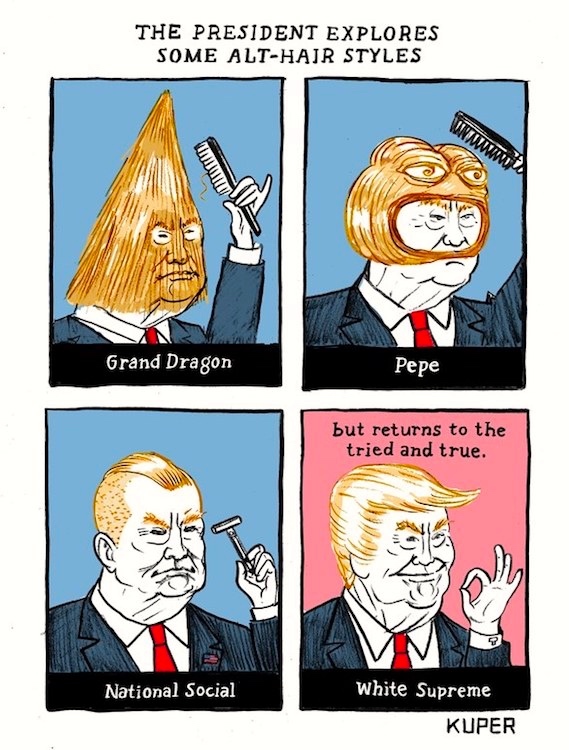 Peter Kuper. Previously on this blog in a 5/6/16 posting. He does alternative comics, graphic novels/memoirs, and gag cartoons. This entry was posted on August 17, 2017 at 4:37 pm and is filed under Language and religion, Linguistics in the comics, Parody, Signs and symbols. You can follow any responses to this entry through the RSS 2.0 feed. You can leave a response, or trackback from your own site.